Up for consideration this time is the extent to which language makes the human species distinct from other species of animal. Firstly, a distinction between language and communication is required; language can be defined as ‘a system for the expression of thoughts, feeling, etc., by the use of spoken sounds or conventional symbols,’ whereas communication can be defined as ‘the imparting or exchange of information, ideas or feelings’ [McLeod, 1991]. It is worth noting that animal communication is most frequently referred to as such: communication. Most research has used the terms animal communication and human language, which suggests from the outset of researching this question a previously established difference between species’ modes of communicative interaction. This essay intends to discuss whether our forms of communication are actually all that different from those of other animals. The main difference between the above definitions seems to be regarding the use in language of speech and ‘conventional symbols,’ which surely, albeit perhaps under different guises, is necessary for the exchanges in any communication. In 1960 Hockett identified thirteen design features of language, which were refined by Aitchison in 1983 to ten. Aitchison specified that four criteria were particular to the human species: displacement, semanticity, structure dependence and creativity. These four criteria, in summary, indicate that humans are capable of talking about things, people and instances, true or false, outside of the here-and-now spatial and temporal environment by using a formalized, abstract set of words, symbols and intonations each of which can have many different meanings when used within different contexts and between different individuals. Communication in animal species can be very varied, ranging from vocalisms to behavioural gestures and movements. Researchers have cited many different instances of animal communication. Some examples are; bees can communicate distances to pollen to other bees using different types of dance [Von-Frisch, 1950]; vervet monkeys use different calls to warn other monkeys about the locations of predators, peacocks use sound as well as visual communication through the rustling of their feathers, some aquatic species [for example Mormyrid fish] use electricity, moths use pheromones and ants can also use chemical signals to communicate with one another [Davies, 1997]. However, the different systems of communication between animals cannot necessarily be qualified as language in the same sense that human communication can and has still not been successfully proven to have in the same variable depths as human language. As our closest relations, a lot of research into animal language has been using apes. One of the more noted of these studies was conducted by Savage-Rumbaugh who taught a Bonobo chimpanzee, ‘Kanzi’, to use a form of sign language. Savage-Rumbaugh  claimed that Kanzi’s language skills using a 256-symbol keyboard were equivalent to those of a two and a half year old child’s, but as the chimp grew older, his linguistic abilities did not increase significantly, whereas a human child’s linguistic ability grows rapidly after this age. This evidence suggests that there is a limit to how much a primate can acquire or develop language, partially restricted by cognitive capacities and partially by anatomical make-up. Areas of the brain such as Broca’s, which seem to have evolved in humans as language areas, in other species the corresponding areas control actions such as arm and non-verbal mouth movements [Preuss, 2000] and the vocal tracts of humans and apes also differ, affecting the sounds that apes are capable of making [Cooper and Kaye, 2002]. Although chimps have been interpreted as being able to make requests and follow instructions, it still unclear the extent to which chimps such as Kanzi understand meaning, rather than, as has been suggested by some researchers [e.g. Pinker, 1994], have merely learnt in a stimulus-response way. Conversely though is the idea that ‘a signal has meaning if it excites a representation of the event to which it relates’ [Pearce, 1987, p266]. On this note, perhaps it is the human capacity for complexity of meaning that distinguishes us, being able to combine the knowledge of what a word means on its own, what it means as part of different sentences, what it means with different tonal inflections and what that all means coming from the person speaking it in the situation it is being spoken in. Another of Aitchison’s suggested criteria is displacement; humans can discuss anything, real or hypothetical, regardless of its presence in the here-and-now or its lack thereof. The only cited examples of this in other animals are in higher primate societies. One example of a chimp being aware of objects other than those in immediate view comes from Kanzi, who could retrieve ‘an apple from upstairs’ ignoring all other apples on the floor he was on [Savage-Rumbaugh, 1998, cited in Cooper and Kaye, 2002, p74]. Premack’s chimp, ‘Sarah,’ was seemingly able to select brown objects on the basis that she had been taught that chocolate was brown, even when there was no chocolate present [Premack, 1971], but this finding was criticized as her demonstrated ‘understanding’ was claimed to be mere generalization. With the difficulty of verifying whether animals, namely primates, have really understood what has been spoken to them beyond conditioned stimulus-response learning capacities, research has more recently focused on animals production of language [as opposed to their reaction to it], relating to Aitchison’s last criterion: creativity. Creativity pertains to the ability to produce potentially infinite number of words, sentences and meanings that have never been expressed before. Animal language is confined by ability to create different tones for their utterances, create internal representations of events and for the sender to able to convey these effectively to the receiver. The third of Aitchison’s criteria is structure dependence and syntax. Humans have grammatical rules to their languages, set ways in which things can be expressed. The symbols we use are abstract, bearing no resemblance to what they refer to. Animals do not seem to have written languages, so this is one major difference between us, but they do use individual vocalisms to mean certain things [e.g. vervet monkeys] and where they lack a written language they compensate for this using things like smells and pheromones. Sometimes radiating these or leaving them on fixed objects or mates as possession markers, for example dogs and cat, even domestic ones. The aspect that is arguably the defining feature of human communication is the quality of its semanticity/meaning, but perhaps it is the social contexts within which we use language that truly distinguishes human and animal communication. The types and varieties of things animals can communicate about are limited compared with humans. It is an important point that in their natural environment animals do not have the variety of things to discuss that humans do, for example, ‘what shall I wear to my interview?’ This sentence alone contains sociological features that would not occur in animal worlds i.e. clothing and employment. Another aspect of human existence that apes do not have the same level of awareness of in their own species is the existence internationally of different subgroups of humans. 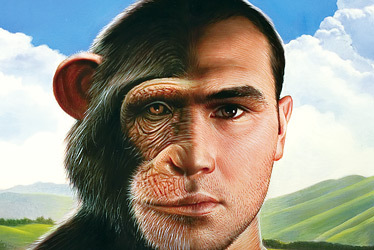 Are apes aware that hundreds of miles away there is a slightly different breed of ape? Would their languages be compatible with each other’s, such as English- United Kingdom, English- Australian and English- American or would it be incomprehensible? Which would we deem to be the more sophisticated; comprehensible or incomprehensible? Which makes the point that our distinctions are based on our own human standards and subject to our perception. So human language’s complexity does seem to be the distinguishing factor between human and non-human animals. It is the facilitatory element by which we came to develop the more obvious distinguishing features such as, for example, our contemporary global infrastructures. By this token, language has made human animals very distinct from non-human animals. However it is worth bearing mind that the precursor to this distinguisher was and is in fact perhaps routed not in the cognitive capacities of our species, but in the anatomical speech restrictions, as selected [or not] for through the course of evolution, of other species and therefore it is not just language, per se, that is the crux of this distinction. The difference may not be in fact to great if taken proportionally. Our availability of things to communicate with one another about is far greater than that of other animal species. If amount of communication material available to different species were measured against their communicative levels and all results standardized, perhaps the actual distinction between human and non-human animals would be less apparently extreme. Aitchison, J. The Articulate Mammal, (2nd edn) Oxford, Blackwell. Cooper, T. and Kaye, H.  ‘Language and meaning’ in Challenging Psychological Issues, [Cooper, T. and Roth, I., eds] The Open University, The Bath Press. Davies, R.,  ‘Kinship and social behaviour- signalling systems in non-human animals’ in Cardwell, M., Clark, L. and Meldrum, C., [eds] Psychology for A-level, HarperCollins, London. McLeod, W.T., [ed]  The New Collins Dictionary, HarperCollins. Pearce, J., M.  An Introduction to Animal Cognition, Hove, Lawrence Elbaum Associates Ltd.
Pinker S.  The Language Instinct, London , Penguin. Premack D.  ‘Language in Chimpanzees?’ Science, vol.172, pp808-22. Savage-Rumbaugh, E. S. and Lewin, R.  Kanzi: The Ape at the Brink of the Human Mind, London, Doubleday. Savage-Rumbaugh, E. S. and Shanker, S. G. and Taylor T. J.  Apes, Language and the Human Mind, Oxford, Oxford University Press.